1942 SPK Vichy French Anti-British Octopus Propaganda Poster Map. WE SELL ONLY ORIGINAL ANTIQUE MAPS - NOT REPRODUCTIONS JOIN OUR WEEKLY MAILING LIST FOR NEWEST STOCK. (FaithâÃÂ¶[His] Amputations are Proceeding Methodically). Description: An exceedingly rare find, this c. 1942 collaborationist Vichy French propaganda poster demonizes Britain and her efforts to wrest control of French and Italian territorial possessions from Axis control. Per War Map ,'propaganda pieces produced by defeated and discredited regimes rarely survive the downfall of their creators. The unattractive consequences of being found after 1944 with such a vicious caricature of Winston Churchill with its associated taint of collaborationism makes this one of the rarest pictorial maps. Featuring a grotesque caricature of Winston Churchill as an octopus, complete with'full red lips seen in many anti-Semitic caricatures of the period, popularized by magazines like Der StâÂºrmer', manic, demonic eyes, and Churchill's ubiquitous cigar, the full wrath of wartime propaganda is brought to bear. 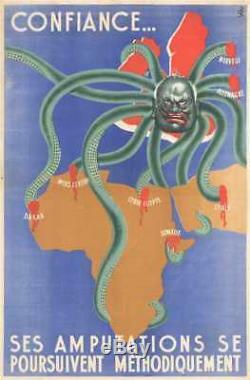 As'Churchill's' tentacles stretch across the hemisphere, reaching from London to Africa and the Middle East, the poster boasts of the'methodical' manner in which these tentacles are being'amputated'. After the complete collapse of the French army when faced with the onslaught of the German Wehrmacht in May-June 1940, France signed a separate peace with Germany that divided the country in two. Britain and Winston Churchill were outraged by France's'dishonorable peace' and vowed to keep fighting. ConfianceâÃÂ¶' functions as a brilliant visual summary of the chasm between collaborationist France and a resistant Britain, unwilling to give in. Each tentacle tells a different story of the fight between Britain and Nazi Germany and the other Axis powers, with collaborationist France now in the crosshairs. In 1940, the French fleet was second only to the Royal Navy in terms of European naval strength and, following France's defeat, the British War Cabinet and Winston Churchill feared the French navy falling into Nazi hands. They believed that, if the French and German navies were combined, it would tip the balance of power in the Atlantic away from the Royal Navy. Thus, following the French surrender, the British demanded that the French either continue the war in North Africa or surrender the fleet to the Royal Navy, in order to keep French ships from falling into German or Italian hands. Vichy and the French Navy declared that, under no circumstances, would they allow French vessels to be seized by German or Italian forces, which meant that the British ultimatum, in their eyes, was invalid. However, even with these reassurances, the War Cabinet and Churchill still deemed the risk of the French fleet falling into enemy hands to be too great. Launched on July 3, 1940, the British attack killed 1,297 French servicemen, sank one battleship, and damaged five other ships, against a British loss of five aircraft shot down and two crewmen killed. The attack was greeted in France with shock, and Vichy severed diplomatic relations with the United Kingdom in response. The old animosity and distrust between Britain and France was renewed and the Germans scored a'propaganda coup'. A little over two months later, the British, this time with support from Free France and General Charles de Gaulle, launched an attack on the French port at Dakar in French West Africa (modern-day Senegal). De Gaulle believed that, if British and French forces appeared in Dakar, the French forces there would overthrow the pro-Vichy forces and join Free France. That, unfortunately for the Allies, is not how events unfolded. When the battle began on September 23, 1940, it began with a propaganda drop over the city, then a Free French plane landed at the airport and the crew was promptly arrested. After that, a boat with representatives of de Gaulle entered the harbor but was fired upon. In the afternoon, a landing was attempted by Free French troops, but it failed due to fog and heavy fire from strongpoints defending the beach. De Gaulle then cancelled the assault, stating that he did not want to'shed the blood of Frenchmen for Frenchmen'. The assembled fleet remained in the area for the next two days, periodically shelling the coastal defenses, but withdrew without gaining a foothold. The entire operation was a failure and not without cost: two ships were damaged, and the attack led to Vichy air raids on Gibraltar, though damage from the raids was minimal. The Western Desert Campaign, fought in Libya and Egypt between June 1940 and February 1943, saw back and forth fighting and both Allied and Axis victories. However, the Second Battle of El Alamein is remembered as a key Allied victory, that led to a British counteroffensive and complete Allied victory over German and Italian forces in North Africa. The Allied victory in the East African campaign was just as important and was the first Allied strategic victory of the war, following the surrender of Italian forces after the Battle of Gondor in November 1941. The Syria-Lebanon Campaign, another Allied victory in July 1941, prevented Vichy French and German forces from gaining a foothold in the Middle East. A British invasion of Vichy French Syria and Lebanon, the Vichy French put up a vigorous defense of the territory, but as the 21st Australian Brigade neared Beirut, the French sought an armistice. This little-known campaign was not highly publicized during the war, as it was believed that hostilities against French forces could be seen negatively in English-speaking countries. This poster is signed by the artist SPK, who also created other Vichy collaborationist propaganda posters. Unfortunately, nothing is known about this artist. It has also been postulated that this poster was not created by the Vichy government but was created and printed by the Propaganda-Abteilung Frankreich , the German bureau of propaganda in occupied France. This piece is extremely scarce on the market. We are also aware of two examples in private hands. This map was reprinted in the 1960s, the the present example is the original propaganda poster from World War II. Size: Printed area measures 45.5 inches high by 30 inches wide. Light infill along original fold lines. If your address is a P. DHL International EXPRESS (45 USD). We can use your Federal Express Account. Duty varies by country and we cannot predict the amount you will be charged. Some countries are duty free, others are not. Additional Services Conservation Framing Services: Geographicus recommends basic conservation framing services for any antique paper. We do not offer this service. Antique Map Restoration Services: Geographicus can repair and restore your antique map. Services include deacidification cleaning flattening and backing. The item "1942 SPK Vichy French Anti-British Octopus Propaganda Poster Map" is in sale since Monday, October 22, 2018. This item is in the category "Antiques\Maps, Atlases & Globes\Africa Maps". The seller is "geographicusmaps" and is located in 11221.